HRT LineStreamer+ transfers vinyl to computer | What Hi-Fi? This nifty-looking gadget has just popped into our email box – the £299 LineStreamer+ from High Resolution Technologies (HRT). 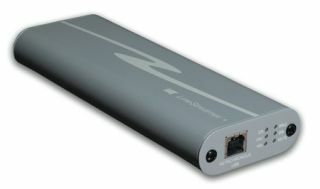 Essentially it's an external USB powered sound card that connects between a computer and any line level analogue source. So you can turn your computer into a digital recorder – ideal for those with lots of vinyl who want to transfer the music to a PC. Using native Audio Class 1.0 drivers (as present in most modern PC, Mac and Linux computers), there are no drivers to install. Just connect the LineStreamer+ to you computer using a USB cable, and away you go. LED indicators show the sample rate (32k, 44.1k, 48k, 88.2k and 96k) as well as the state of the mute circuit. A pair of peak indicators on the input side allow you to monitor the recording level. HRT's UpStream utility means the LineStreamer+ firmware to be updated from the computer's desktop in just a few seconds. The HRT LineStreamer+ will be dsitributed in the UK by Audiofreaks and is available this month.